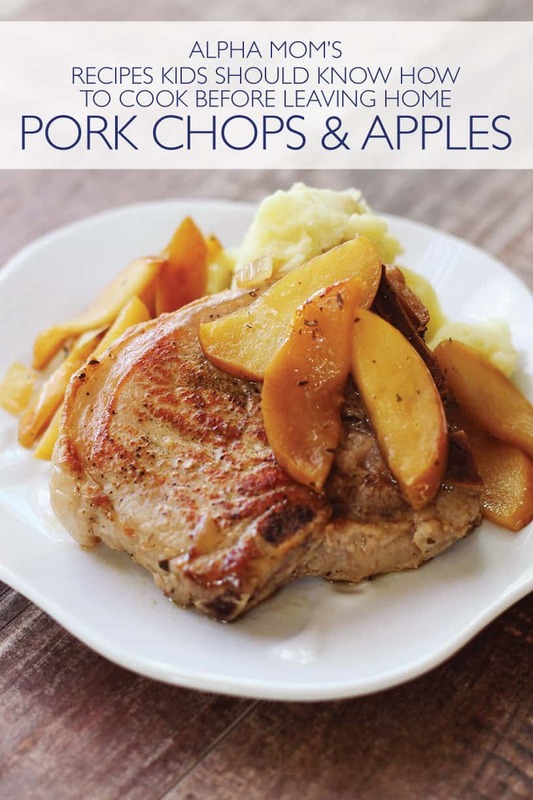 Knowing how to make pork chops is a great skill because this classic dish can be both impressive as well as cozy and homey. 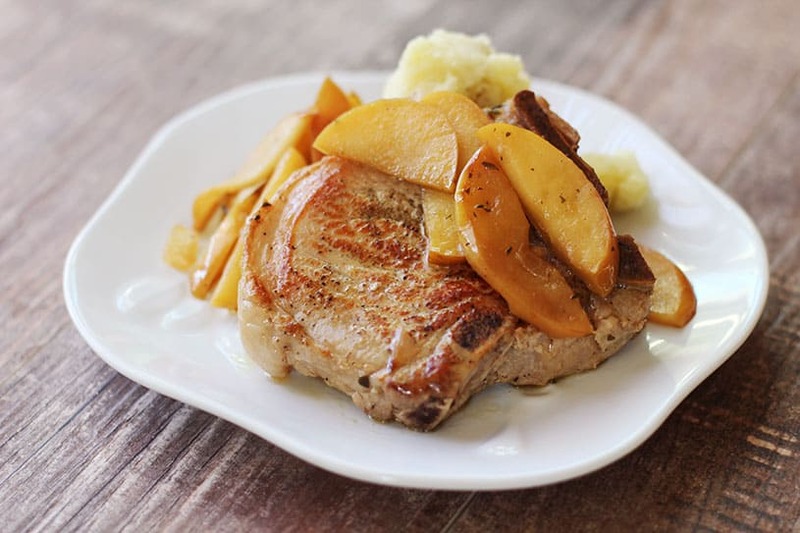 Cooking apples with the pork chops really take them to a delicious place, adding a lot of flavor to the sauce as well as a nice sweet contrast to the meat. 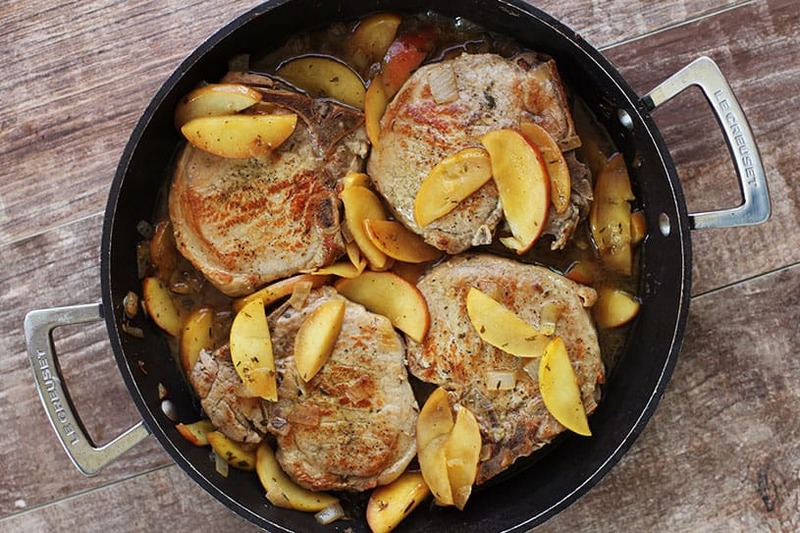 Today we’re going to talk about how to make pork chops with apples so you can make them for your family and, one day, yourself! This is why we think it’s a meal that kids show know how to make before leaving home. 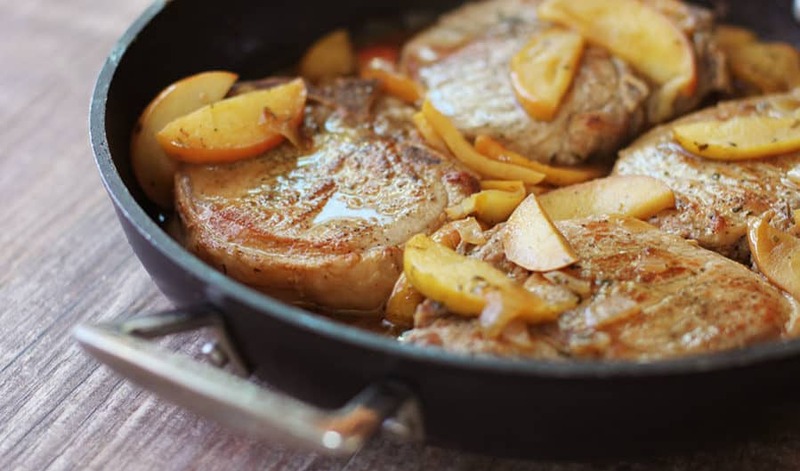 Cooking pork chops is not hard and the preparation is quite simple, however, it’s really easy to mess them up. Want to know the secret? Don’t overcook them! Pork chops really should be cooked only to medium rare, which is what you get when the meat reaches an internal temperature of 145º F. Don’t worry, the pork is safe and this temperature is what experts recommend. Go beyond that and the meat just gets tougher and tougher, making it not such a great meal after all. Having an instant-read thermometer will really help you cook the pork chops just right. My favorite part of this particular recipe is the au jus, which is the thin gravy from the cooking juices left in the pan. It just tastes so darn good, and I like to drizzle it over everything on my plate! This recipe only uses one pan, making it a nice go-to meal for any day of the week. 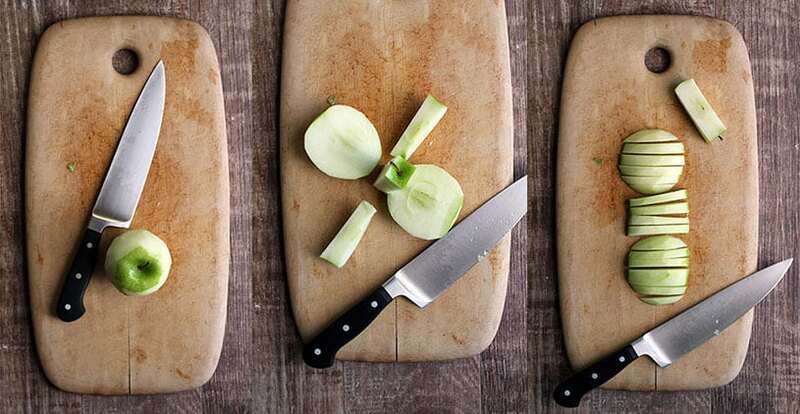 Chop the onions and slice the apples and set aside. Heat a large, deep 12-inch skillet on the stove over medium-high heat (on a dial of 1-10, this would be around 8). While the pan is heating up, sprinkle the pork chops evenly on both sides with ground sage, kosher salt and pepper. Add 2 tablespoons of the olive oil to the pan. Using tongs, carefully place each pork chop into the pan, pushing each chop around the pan a bit to spread the oil around. Cook the pork chops in the pan about 5 minutes per side, until they are browned, with nice dark brown spots on the chops. 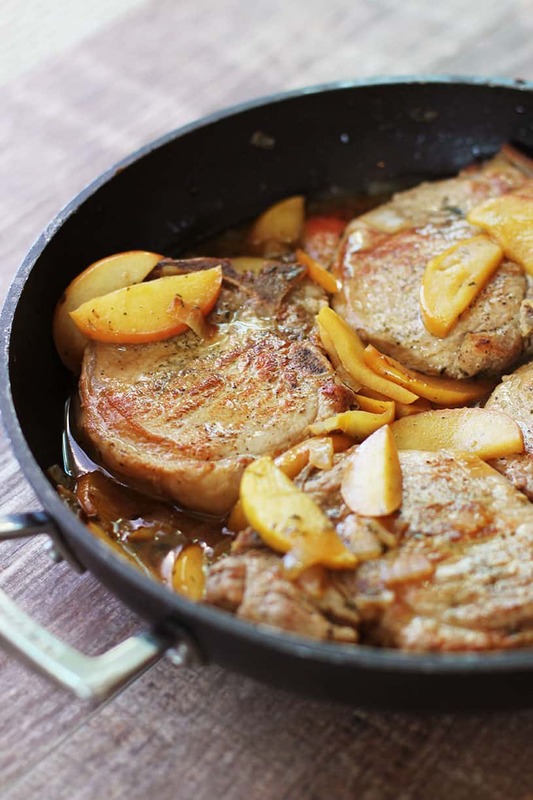 Using the tongs, remove the pork chops from the pan and put on a plate and set aside. Keep the skillet on the burner and reduce the heat to medium (5 on a scale of 1-10). Add the last 2 tablespoons of olive oil to the pan. Add the onions and apples. Saute the onions and apples for about 5 minutes, stirring regularly. Apples should start to brown on some sides. Add the chicken stock, apple cider vinegar, 1/4 teaspoon sage, 1/4 teaspoon thyme and 1/2 teaspoon parsley to the skillet. Stir everything together and reduce the heat to medium-low (3 on a scale of 1-10). Using the tongs, put the pork chops back in the skillet, also pouring in the juices that have accumulated on the plate. Cover the skillet and simmer on medium-low (or low if things are bubbling a lot) for 5-10 minutes. The internal temperature of the pork chops should be 145º F – using an instant read thermometer, measure the temperature of the middle of the thickest part of one of the pork chops. Once you reach 145º F, turn off the stove and remove the skillet. Serve immediately. Delicious with mashed potatoes or rice, and I even like the pork chops served over a bed of greens.